#3. Lavender – of all the essential oils Lavender (and rose) is the most versatile of all oils, containing properties, ranging from antidepressant to insect repellent and everything in between (analgesic, antiseptic, bactericidal, decongestant, hypotensive, sedative, vermifuge). Basically to be summed up – calming, soothing and most of all balancing! Lavender is most of all known for its ability to bring balance back to mind and body, for it is only in the state of homeostasis that healing can take place. Lavender’s versatility is due to its complex chemical structure. It is still one of the herbs listed in Britsh Pharmocopia and it is the oldest. It has been used for thousands of years in various forms. There are several varieties of Lavender which are of medicinal use, sometimes there is confusion about the names of the species. Lavandula officinalis is the most important variation medicinally, however it is also known as Lavandula angustafolia or vera, which means “true lavender”, This is the most loved and used essential oil in aromatherapy. As many might know, it is French cosmetic chemist Gattefosse, who observed a healing effect of lavender. While conducting experiment in his lab he had an accident during which he burned his hand. The story goes, than he dipped his hand into a vat with lavender oil, thinking it was water. Well, that is when he noticed the incredible healing effect of lavender, it took away his pain and later left no mark of his significant burn. He was the one who coined the word Aromatherapy. Other persons of great importance to aromatherapy is Dr. Valnet, he used lavender oil during WWII to treat serious burns. Another story goes that at some point he ran out of medicine to treat soldiers wounds, he turned to essential oils , and many soldiers’ lives were saved. Analgesic, antiseptic and antibiotic properties will come handy when you are suffering from colds, coughs, sinusitis, even flu. Best method here is STEAM INHALATION. This can sooth, decongest and attack bacteria and virus. Usually 2 to 5 drops in the basin, covering your head completely and steaming for about 2 to 5 minutes. Sedative. Cant’ sleep? Go for lavender, just drop 2 drops on your pillow and you will drift away to sleep. Taking a bath with just 4 drops of lavender will do the same. Headache – rubbing one drop of lavender on your temples will relieve many forms of headache, especially of nervous nature. Sometimes this does not work. Then a cold compress with lavender will do the trick. 2 drops of lavender in water basin, then place cloth right over it, do not push down. Let the cloth absorb the water. Once it is fully soaked, squeeze gently out the excess water, and place over the forehead the part the touched lavender. Once the compress got warm repeat this procedure, if needed. 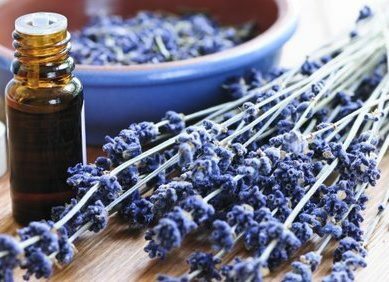 Muscular pain – of the best uses of lavender. Surprised? It is best to use in massage and it works at its best when combined with Marjoram, Rosemary and Pepperming. My other favorite oils for muscular pain is black pepper, basil and eucalyptus lemon. Other pain – lavender is great for relieving pain associated with rheumatism, arthritis, sciatica. It is every effective at reducing pain locally, how? It lowers reaction of the central nervous system to the pain, reducing inflammation. Skin – lavender is one of the best oils to use for anti-aging, scar, spots. It is one of the best oils to use on acne, combining it with tea tree and lemon. Lavender will serve as antiseptic, soothing to the skin, sebum production balancer (geranium is another great essential oil for sebum production balance and clearing pores). Combining lavender with Neroli – a very strong anti-aging effect can be achieved. It is a cellular renewal bomb. No duo works better on stimulating new healthy cell growth than the two above. Psychological plane – very balancing in nature will work on many disorders of psychological nature – from hysteria to manic depression. Often when I am asked about what essential oil to use, and I often I recommend lavender… this raises suspicions in some people J. We are accustomed to conventional medicine, one drug per condition (although many side effects). But please, remember, lavender is one of the most chemically complex oils with a great variety of uses, some of which were described above. So, don’t forget to pick up today a bottle!